Thomas Cook Airlines has also announced today that it is partnering with FTEJerez to attract more women to piloting. The scholarship will be co-sponsored by Thomas Cook and FTEJerez and is in of Elise Raymonde de Laroche, a French pilot and the first woman ever to receive a pilot's licence, 108 years ago on this day, March 8, 1910. The scholarship is open for female applicants to be trained at FTEJerez as part of the Thomas Cook Airlines Mentored Cadet Pilot Training Programme. Female pilots entering this programme will be eligible to apply for the €30,000 scholarship which will be offset against their training costs at FTEJerez. The scholarship will run every year for the next five years. 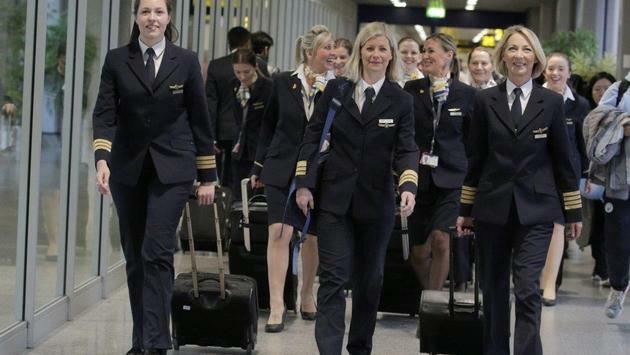 Paul Hutchings, UK Managing Director and Group Airline Director of Operations at Thomas Cook Airlines says, “With International Women’s Day today and Women of Aviation Worldwide Week, there was no better time to fly an all-female crew and highlight that our industry is for men and women. We want to raise awareness of the many opportunities to build a career and encourage more women into the aviation industry at all levels. Today’s flight was captained by Jane Paros, who has been flying since 1990 and is also a training captain for Thomas Cook Airlines, with First Officer Berglind Rafnsdóttir-Teasdale. First Officer Victoria McCarthy also joined the flight on Thursday to talk to customers on board. The crew comprised Victoria Starkey, Faye Emanuel, Lindsay Dixon, Stephanie Ashall, Susanne Johnston, Victoria Britland and Kelly Adrio. First Officer Berglind Rafnsdóttir-Teasdale is also a member of the pilot recruiting team at Thomas Cook Airlines and conducts both pilot interviews and simulator training. The Thomas Cook Mentored Cadet Pilot Training Programme will open for applications on 16th March 2018. Further details can be found on the FTEJerez website ftejerez.com.